Two weeks ago my daughter was misdiagnosed, and sent out of the doctor’s office with nothing to counteract the bug she’d caught on a road-trip. Later in the week, fearing things were getting out of hand, my wife and I took her to a late-night clinic to get another opinion. Upon examination, when the doctor said we were dealing with a “raging ear infection,” we weren’t surprised as we’d initially brought our daughter to our regular doctor because she’d had a severe ear-ache. Indeed, the truth sometimes hurts, but it beats incompetence by miles, so in some ways, we were all relieved. The doctor left the room to arrange getting the antibiotics necessary to effect a cure, and we knew we were on the right track. My first thought was, “Uh-oh..,” but I said nothing. We said, indeed, she could. My wife said that, in fact, we are. Now, because of her remarks, we left that clinic with far more than a prescription. For such a reception it makes you want to be sick! What a nice, and courageous thing to say! By asking her question, the doctor was putting her own cards fully on the table, and it was a great lesson for us all. Faith doesn’t always mean sharing our doctrines. It can be extremely powerful simply affirming the spirit of others. Leaving the establishment, my daughter still had a fever, but we were all walking on air. It was a special blessing encountered only because we’d experienced the bacteria of personal frailty and weakness. The sickness passed quickly with the treatment. However, the unexpected grace, boldly imparted, will endure. Amazing that Tony seems to have forgotten that Whitney Houston tossed her life away by abusing legal narcotics. Prescription drugs obtained from a doctor. Just like Michael Jackson, and Elvis. Of course, this morally decrepit declaration came in direct context with a program giving center stage and an enormous platform to Chris Brown — the great talent who beat up his girlfriend, just after the 2009 Pre-Grammy Bash. I forget who gave this advise to pop stars and the like, but I believe it. By and large, entertainers should just “shut up and sing.” That’s all they are asked and qualified to do. Messing up their own lives for all to see is not a qualification to ruin the lives of others. So after driving my last car for 7 years, I thought it was time for a new ride. Not really new. Just new for me. I never buy new cars. I buy very high mileage vehicles, with around 100k, and typically add another 80k before doing it all over again. My last vehicle was a ’99 Acura CL, Premium Edition, purchased with 94,000 on the clock and sold with 165,000 give or take. Beautiful conveyance powered by a V6 3.0 V-Tec engine, and I just did usual maintenance and filled it with gas. Originally, it set me back about $8500. without factoring in the ’92 Subaru SVX that I sold towards it. The SVX was an exceedingly rare gem that I drove from a bit over 110K to 190,000 miles. Same thing as usual. Change the oil (Mobil 1), put in gas, drive in style. The trick in all this is to research and find makes and models that have a great track record over years of recorded stats. Typically, Hondas, Acuras, Nissans, Toyotas, and others, fit this bill, but there are some models within these brands that really stand out. When was the last time you heard of someone having troubles with the Honda Civic? Could it happen? Sure. But what usually occurs is these cars run pretty reliably for 200,000 miles. I had a ’91 Geo Prizm GSI (actually a twin to the Toyota Corolla, except with a Celica engine in it). Eventually I sold it to a neighbor for $1000 (at 185,000 miles), and they put another 50k on it, no worries. Though they said the front end was getting a bit squishy. So, after checking out various info sites and Consumer Reports, you go out looking and insist on bringing any potential purchase to your own mechanic for a full check. This costs about $80. but it’s well worth it, and if a seller won’t allow this, you walk. It’s also good to start a car after it has sat over night. Watch the tail pipe. Blue smoke? Walk. As a side note, whatever you get, make sure you change the timing belts, if the car uses them. If in ANY doubt, just change them, because if they go, so does your engine. 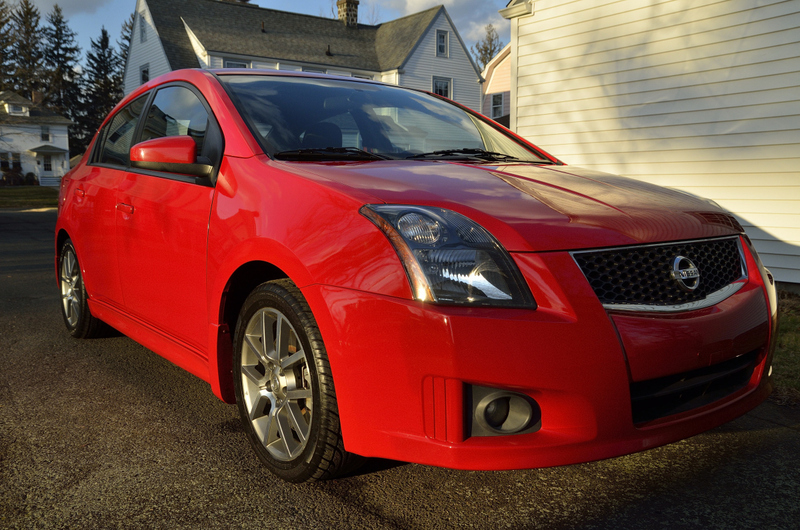 My most recent acquisition is a 2008 Nissan Sentra SE-R SPEC V, with a 6-speed Manual, 200HP engine. It’s solid as a brick, easily holds four adults, goes like a rocket ship (0-60 in 6.5 secs.) and gets 30mpg on the highway. Very quiet at 90mph, but still, I try to keep it under 80. I’ve never gotten a ticket on the freeway and I don’t want to start now. This last automobile I came about differently as it was purchased at CarMax, with a 5-day guaranteed return policy. After purchase I took it to my mechanic who said it looks perfect, except for the brake pads which could be a bit thicker. Of course, I don’t use the brakes that much, but the dealer says they’ll look at them anyway to see about putting new ones on. In addition, this car only has 34K on it, just coming off a lease. So, unless I smash it (thank Heaven, I’ve never had an accident), I could be in this thing for the next 15 years! In general though, paradigms have shifted. Cars are made better. The materials used are better. The old school 60,000 mile barrier is way out of date, and it is very possible to drive a vehicle from the 100k to 200k range and laugh all the way to the bank. It takes a bit of work to pull this off, but it costs a good deal less money. Time and again with this approach, I’ve driven cars for years that I’d never have been able to purchase new (or wouldn’t want to), thus leaving extra cash for things like family vacations. It’s fun! And it’s comparatively cheap. You are currently browsing the BillKeane Perceptions blog archives for February, 2012.